This configuration option is used to define the SAP Business One remit contact information. Most fields define mailing address details, except where noted in the definition table below. The Integration Configuration screen can be opened in SAP Business One: SPS Integration > SPS Integration Setup > Integration Configuration. 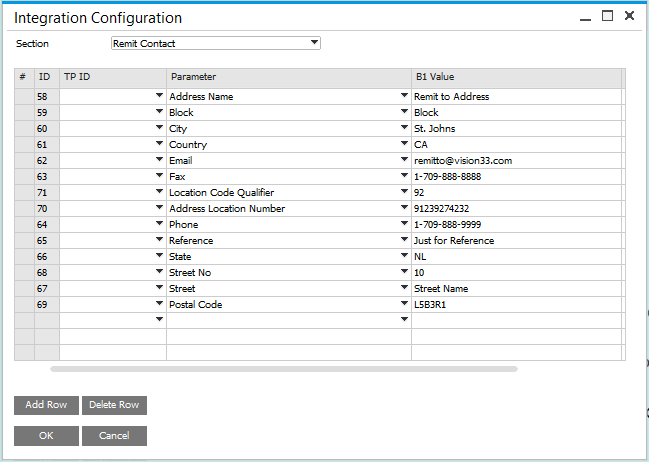 Configure details for remit contact information as shown. Note: Only the B1 Value field is required. External Value and TP ID fields may be left blank. Unique name for the location. Used in B1 to identify the Remit Contact. If applicable, relates to the Contact Location CQ. Optional. Additional information on remit contact, if needed.